An anti-militia protester gunned down on November 15, 2013. January 9, 2014 – Links International Journal of Socialist Renewal -- In recent months there has been a wave of protests against militias in Libya’s cities. The militias are armed groups originally formed during the 2011 civil war. Most are based in particular towns or regions, but they sometimes try to exercise power over a wider area. There is widespread resentment at their arbitrary exercise of power. One protester told the Libya Herald that the militias “terrorise, steal and kidnap people”. On November 15, 2013, protesters marched on a militia base in Gharghour, a suburb of Tripoli, Libya’s capital. The base was occupied by a militia from the city of Misrata. The protesters were demanding that the militia leave Tripoli. 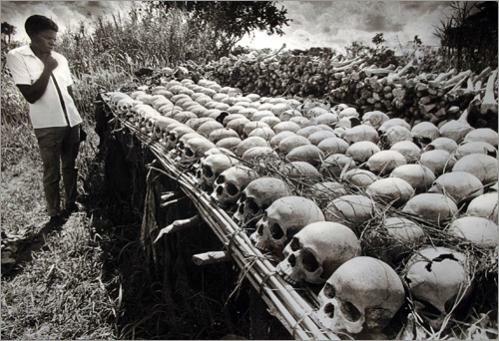 But the militia opened fire, killing 47 people and injuring 500. This led to more protests. The Tripoli local council called a general strike, initially intended to last three days. April 21, 2013 -- SocResVideo -- Adam Hanieh addressed the 2013 April 2013 Socialist Resistance conference in Britain on the social upheavals in the Middle East and their strategic context. Tariq Ali on Russia Today, July 13, 2012: "We have a very grim, polarised situation in which the choices are limited: either a Western-imposed regime composed of sundry Syrians who work for the Western intelligence agencies ... or the Assad regime. It's clear the people of Syria want neither ..."
January 12, 2012 -- Counterfire via International Socialist Group (Scotland) -- The Syrian popular movement has witnessed an increasing mobilisation in recent weeks – the most important since last summer – despite the continuous violent repression. Defections within the army are still happening on a growing scale. Ten months after the beginning of the revolution – and despite the 6000 martyrs – the popular movement is continuing, though there are profound political divisions among the opposition. The two most well-known political opposition groups are Syrian National Council (SNC) and National Coordination Committee for Democratic Change (NCCDC), in addition to the Local Coordinating Committees and other groups on the ground. Many political groups are not yet represented by the two main opposition groups. Above: December 28, 2011 -- Tariq Ali interviewed on Russia Today. Below: Tariq Ali interviewed on Russia Today on January 6, 2012: "It has to be said that the Syrian regime has brought this upon itself". Placard at a Occupy Washington DC protest. November 7, 2011 -- ML Update -- It was Iraq in 2006. It is Libya today in 2011. In 2006, the administration of US President George Bush had celebrated the conquest of Iraq by exhibiting the mutilated body of Saddam Hussein as a prized trophy. The spectacle of celebration of Libya’s "liberation" is turning out to be remarkably similar. On October 20, 2011, the world came to know about the ruthless elimination of Libya’s deposed ruler Muammar Gaddafi. He was captured alive – and unlike in the Saddam case there was no pretence of a trial – only to be murdered brutally and his blood-streaked body was put on display in a commercial freezer at a shopping centre in Misrata. Around the same tIme his son, Mutassim, was also captured and killed in Sirte, reportedly the last stronghold of the Gaddafi regime. While Barack Obama's administration and NATO immediately hailed the "liberation" of Libya, US and French flags could be seen being waved on Libya’s streets alongside Libyan flags. Amnesty estimated up to half those detained were migrant workers from Sub-Saharan Africa, who have been persecuted since the beginning of the conflict over spurious allegations that they served Gaddafi as mercenaries. October 31, 2011 -- Green Left Weekly -- The October 23 declaration of Libya’s “liberation” by the National Transitional Council (NTC), the de-facto government since taking Tripoli from former dictator Muammar Gaddafi on August 21, was a showcase victory for the West’s vision of how the Arab democratic awakening should progress. By March 17, with the regime's forces preparing to attack the rebel-held eastern city of Benghazi, a NATO intervention was sanctioned by a UN Security Council resolution in the name of protecting civilian lives. 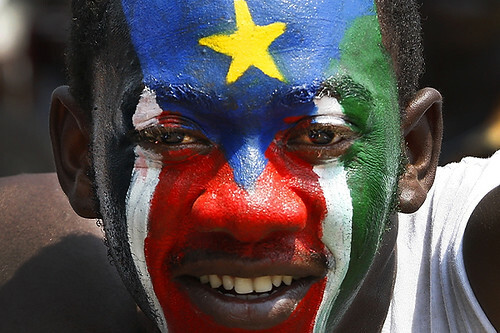 South Sudan celebrates independence. Photo by babasteve. September 6, 2011 -- Pambazuka News, posted at Links international Journal of Socialist Renewal with the author's permission -- I have decided not to separate Sudan and South Sudan in my articles because developments in both places, even after the secession of South Sudan as an independent country, are linked to how Sudan, Africa’s biggest country, was shaped historically and how it functioned as a country. The crisis in Sudan is a crisis of capitalism in post-colonial Africa but manifests itself through the way capitalism specifically functions in Sudan. Celebrations in Tripoli following Gaddafi's retreat. August 31, 2011 -- ABC's The Drum -- Libya, the source of so many American nightmares, is fast becoming an American dream. Reagan was tortured by Tripoli, and its big boss man, sassing the US. He imposed sanctions, and bombed the country, but had no peace. Bush the Younger was reconciled with the prodigal Colonel Gaddafi, but somehow this alliance seemed, well, un-American. Obama, though, will have the privilege of being an ally of an ostensibly free Libya that he helped birth into existence. At minimal outlay (a mere $1 billion, which is peanuts in Pentagon terms), and with relatively few lives lost from bombing, a US-led operation has deposed a Middle East regime and empowered a transitional regime that is committed to human rights and free elections. After the carnage of Iraq, such a simple, swift and (apparently) morally uncomplicated victory seemed impossible. Lest we swoon too quickly, however, it is worth remembering that there are other ways to look at this. 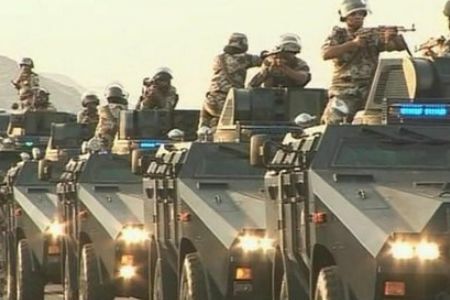 Saudi Arabian troops enter Bahrain to crush the democratic uprising. August 23, 2011 -- RightWeb -- At the end of February 2011, it looked as though the old order was crumbling across the Arab world. Inspired by the self-immolation of a Tunisian street vendor, massive popular demonstrations ousted Tunisia's president Zine El Abidine Ben Ali and Egypt's president Hosni Mubarak was not long to follow. Similar uprisings began to swell in Algeria, Jordan, Bahrain and Yemen, and the anciens regimes appeared helpless against the rising tide of popular anger and nonviolent resistance. Saudi Arabia, meanwhile, actively worked to encourage the forces of counter-revolution throughout the region. From Morocco to Bahrain, Saudi finance, support and intelligence has sought to prevent political turmoil, reinforce existing dynasties and crush nascent democratic movements before they could reach critical mass. This reactionary tide has been supported by some ideologues in Washington, which worries that Arab democratisation would be detrimental to US policy objectives. Libya: NATO's 'conspiracy' against the revolution; Who are the Libyan rebels? Gilbert Achcar interviewed on August 24, 2011 by Democracy Now!. Transcript below. The following article, reposted from Jadiliyya, was written before the entry of rebels into Tripoli on August 20-21, signalling the looming collapse of the Gaddafi regime. It offers valuable analysis of the dynamics between imperialism and the rebel movement and the Libyan masses. It contends that the Western powers, in an attempt to control the uprising, rationed their military support to ensure that significant sections of the Gaddafi state would be retained in any post-Gaddafi regime.